The CGE Pro 925 Schmidt-Cassegrain Telescope is part of Celestron's "Top-of-the-Line" computerized German Equatorial mounted astronomical telescopes. 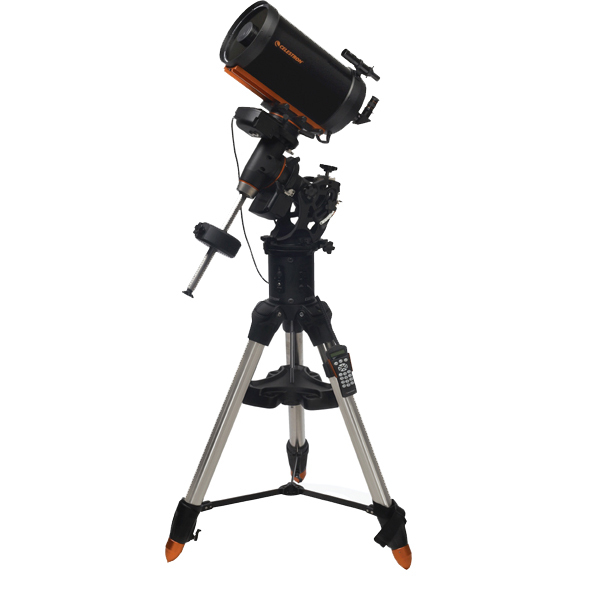 It is the most portable of the three size models and comes mounted on Celestron's new CGE Pro EQ mount. This telescope is especially at home as a solid platform for long exposure photography with optional CCD cameras or photographic equipment. With over 9 inches of aperture and our premium StarBright XLT coatings, the CGE Pro 925 gives you over 1000 times the light gathering power than the unaided eye. As a visual instrument, you can search for all of the Messier Catalog objects, and you can see hundreds of other equally interesting NGC, IC and Caldwell objects. Turn this scope to the planets and see amazing detail on the surface of Jupiter; see Cassini's Division in the rings of Saturn, and resolve details on the surface of Mars. Even the distant Uranus, Neptune and Pluto are within your reach. Increased Payload Capacity - With a maximum payload of 90 lbs, the CGE Pro mount is able to hold the 9.25" telescope more securely even when fully loaded with all your imaging gear. Mount Calibration - Celestron's NexStar hand control has built-in compensation features essential for accurately placing small objects on the center of your CCD chip or high power eyepiece. Aligning on multiple Calibration Stars creates a model of the opto-mechanical inaccuracies inherent in all equatorial mounts. This model is stored within the hand control and is used to compensate for these inaccuracies, thus improving your pointing precision each time you slew your telescope. Stability - Recognized for superior stability, German Equatorial mounts place the center of gravity directly over the tripod legs and can be easily polar aligned without the use of an optional equatorial wedge. This proven design reduces the “tuning fork” vibration that can be associated with undersized fork mounts. An improved Super HD Tripod supports the CGE Pro mount. This fully extendable tripod is made from the finest 2.75" stainless steel and can be raised to a height of 55". The tripod uses a dual leg support for maximum rigidity with an upper leg brace to provide an outward preload and a lower leg brace providing inward tension. Balance - CGE Pro Equatorial mounts can easily be balanced in both axes. Simply sliding the counterweight for Right Ascension and moving the optical tube along its dovetail mounting for Declination, accomplish balancing the weight of camera equipment and other visual accessories. This means that no additional weight needs to be added to balance the telescope when additional accessories are added. Clearance - CGE Pro mounts support their tubes at a single contact point allowing the tube to move freely around its polar axis without making contact with the telescope's mount. Software features allow the user to set the mount's slew limits to guaranty safe motion. This is particularly useful when adding photographic and CCD instruments that extend from the rear of the telescopes. All CGE mounted telescopes are compatible with Celestron's SkySync GPS accessory. Combine the GPS and built-in real time clock and these telescopes will keep track and remember their exact location and time without having to enter the information into the hand control.